Sailing in through the beautiful archipelago on the first day was lovely – we arrived late morning and opted for the Sightseeing Hop On-Hop Off buses (more about that later as it didn’t go to plan!) as we could get a combo-ticket to include the Hop On-Hop Off boats and entry to ABBA The Museum – YIPPEE! 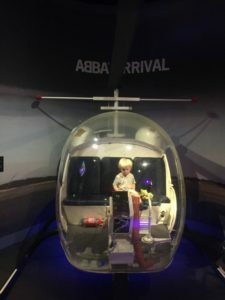 ABBA The Museum is a must for fans (like me! ), but has lots to entertain those less enthusiastic about Waterloo and Dancing Queen! We spent most of the afternoon here, then had a late lunch at one of the restaurants outside – excellent food here! Note that the museum does not take cash, so if you want to buy tickets on arrival or souvenirs from the shop you’ll need a debit or credit card. We waited for a bus… it never arrived… so we walked back to port, which was about 45 minutes. It was a lovely evening and we got to see parts of the city we wouldn’t have got to see before, albeit some dull bits amongst the beautiful museum buildings! Having Elliot with us, we stayed on the ship for the evening – our balcony faced the industrial docks, but you’d be surprised how pretty they can look at night while listening to the waves lapping and the sounds of the city in the distance. The next morning we set off again for the city – we were heading for Gamla Stan, which is such a beautiful old town with so much character and many shops and cafés. We had to be back on the ship by 3pm, so we headed for Skeppsholmen, which we discovered on our last trip to Stockholm – it’s a peaceful part of the city so we enjoy walking here. 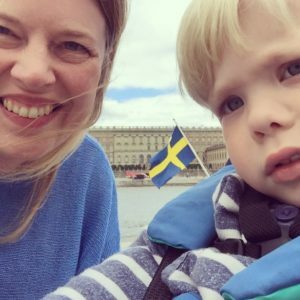 This time though, we discovered the museum of modern art (Moderna Museet) – it is fabulous!! Most of the museum is free, with some excellent displays and artwork by Matisse, Picasso and Dalí to name very few! There are a couple of restaurants here, a coffee shop (delicious cardamom buns!) and a super gift and book shop. We spent such a long time in the art museum that we didn’t have a lot time time left, so we waited for a bus… it never arrived… so we walked back to port, but with much more rushing that the previous day! Back onboard we picked up some cocktails and headed to our balcony – the sail out of Stockholm is beautiful – there’s quite a bit of that in our video below! 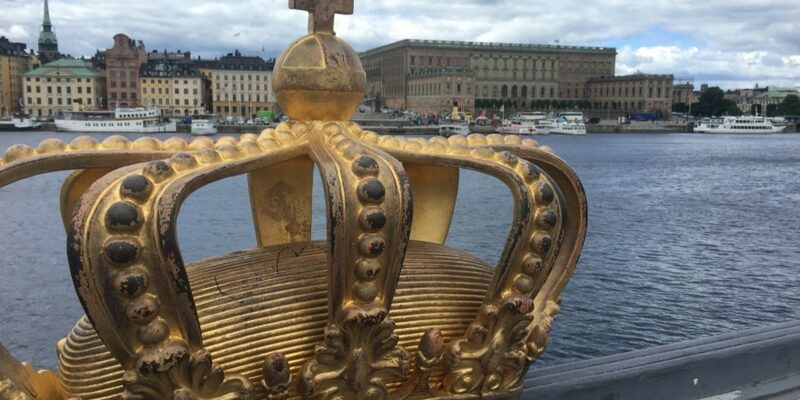 We absolutely love Stockholm – it’s hard to fit in everything the city has to offer when visiting on a cruise, even when you’re overnight in port, so we recommend landing your trip and your travel around the city to make the best of your time here. So, the blummin buses! We’d opted for the Sightseeing Hop On-Hop Off buses operated by Stromma Stockholm – it’s important to note there is another hop on-hop off company ‘Red Buses’ and they look much the same and this seems to cause much confusion for tourists. For the tickets were being sold at the port by reps outside the port building. We queried the price, asking if there were any offers, and they sent us round the corner to the bus where we got a better price – weird! Anyway, off we went, happily knowing that we could get around the city easily by just hopping on and off – or so we thought! When we swapped the bus for the boat, we had to wait 30 minutes for the boat, yet from the reps at the port we had the impression they were every 20 minutes – we let that go, 10 minutes isn’t much after all. When we left the ABBA museum, no bus arrived – on checking the timings we saw the buses stopped at 5pm, not great for cruise tourists, but also it was about 4.15pm – no bus arrived, so we started to walk the route to the next stop. No bus passed us, so we kept walking. On the second day the wait at the port for buses was ridiculous – they only started at 10am with one bus and the queue was huge. They kept telling us that there would be another soon, but it was a good 20-30 minutes of waiting, which still didn’t satisfy the queue behind us. Trying to return in the afternoon was terrible, too – we were waiting at a stop for 30 minutes (keeping in mind that the rep said buses every 10-15 minutes! ), then a bus passed us waving that it was too full to stop. At this point we couldn’t risk a wait and another full bus, so we started to walk – we are pleased we did, no buses passed us and we only made it back to the ship with 10 minutes to spare. There were certainly not as many of the Sightseeing buses as there were the Red Buses – next time I think we’d consider Red Buses as others on the ship had little issue with them over the two days, but we’d probably head for the bus stop just outside the port and take the city buses instead. We did complain to Stromma about our experience and they have since kindly refunded our ticket costs. If you have any issues while travelling with them, do retain your receipt as they will ask for this if you submit a complaint.